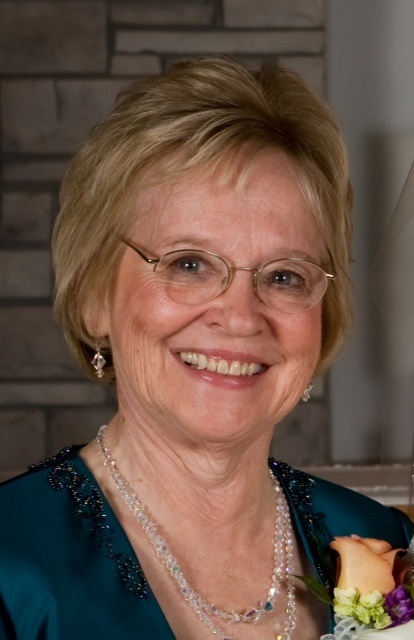 Nadine Marie (Eide) McCoy, 83, of Liberty, MO, passed away peacefully on March 31, 2019, at her home with family at her side. Visitation will begin at 9:00 am, Rosary at 10:30 am, and Mass of Christian burial at 11:00 am, on Wednesday, April 3, at St. James Catholic Church, 309 South Stewart Road, Liberty, MO 64068. Private interment will be in Resurrection Cemetery. In lieu of flowers, memorials are suggested to the St. James Building Fund or Kansas City Hospice. Nadine was born September 21, 1935, in Des Moines, IA, the daughter of Thorval and Elma Eide. She graduated from Luther High School in Luther, IA, and received her Bachelor's degree in Education from Iowa Wesleyan College in Mt. Pleasant, IA. Her career in education spanned more than three decades, retiring from the Kansas City, MO School District. She was a member of St. James Catholic Church. Along with her parents, Nadine was preceded in death by her husband of 65 years, Lawrence McCoy, in January, 2018. She leaves her children, Mark McCoy (Alice), Joan Schneider (Dean), and Matt McCoy (Suzanne); grandchildren, Heather McCoy, Anne Girdner (Joe), Joe Ensminger (Brooks), John Ensminger, Boston Schneider, Byron McCoy (Bridgette) and Casie Harris (Sam); eight great grandchildren; siblings, Betty Lou Mayer, Robert Eide (JoAnn), Ronald Eide (Mary) and Deb Archbold; as well as many nieces, nephews, other family members and good friends, including "the girls" in her book and bridge clubs. Nadine once penned, "Family and friends write the poetry of life". Visitation will begin at 9:00 am, Rosary at 10:30 am, and Mass of Christian burial at 11:00 am, on Wednesday, April 3, at St. James Catholic Church, 309 South Stewart Road, Liberty, MO 64068. Deepest sympathy to the family. Nadine and Lawrence were such a nice couple, always very sweet. We will miss seeing Nadine's beautiful smile, just as we have missed Lawrence by her side, always sitting in the same spot in church (a great spot where we were able to say a brief hello on our way to communion). So glad they can be together again. Condolences to all. It was my honor to be able to teach beside Nadine for 7 years in Kansas City Public Schools. She was an inspiring teacher, willing to help others, and share ideas. She helped make me a better educator. My sympathy to the family. I taught with your mother at Harlan School in Mt. Pleasant in the mid-70s. She helped me with my first year of teaching 3rd grade. My husband, Mooner (Marion) went to school with Mark. Nadine was such a sweet lady.